(L-R) Nakera Symonette, Scotiabank Snr. Mgr. of Marketing & PR, Leandra Moonsammy, Mrs. Williamson, Nowé Harris-Smith, Anthon Gardiner, Joanne Knowles, Linda Huber, Melissa Maura & Greg Stuart, Scotiabank Dir. of Corporate & Commercial Banking Center. 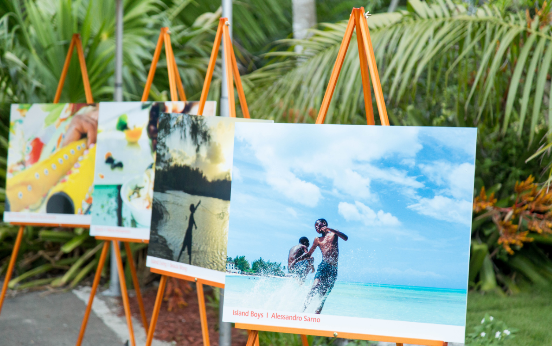 Nassau, Bahamas - In a display of vibrant color and captivating imagery, Scotiabank unveiled the 2018 ‘Exceptional Moments’ calendar during the Bahamas National Trust Wine & Art Festival member’s night. The twelve winning images were selected from a pool of hundreds submitted by photographers vying for a spot in the annual calendar. Photographers were tasked with submitting images that depicted their interpretation of an exceptional moment in The Bahamas. The calendar winners were the guests of honor in the Scotiabank private lounge during the Festivals members’ night. As they enjoyed seeing their photos displayed on large canvases, the Festival attendees also got an exclusive preview of the calendar photos before they are made available in branches. Photos on display during the BNT Wine & Art Festivals members night. The Scotiabank 2018 ‘Exceptional Moments’ calendar will be available in branches late November. The 2017 winners of the calendar contest are Alessandro Sarno, Gaby Rguez, Meliciana Bethel, Nowé Harris-Smith, Anthon Gardiner, Melissa Maura, Beaulah Wong, Joanne Knowles, Leandra Moonsammy, Nikita Williamson, and Linda Huber.